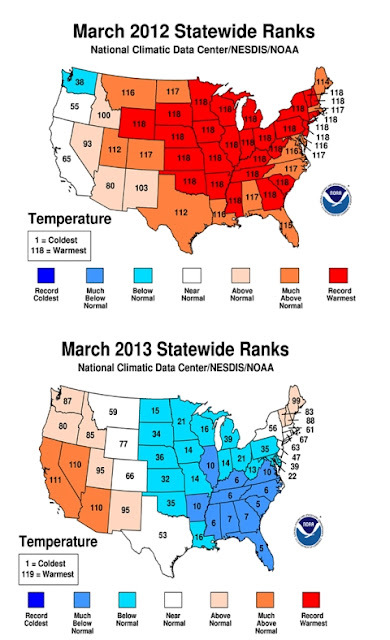 We've said a lot about how much cooler March 2013 was than March 2012, probably more than what a few of you want to see. However, a couple of graphics really show the extent of temperature difference that we did not get into. First, temperature departures to normal for 2012 (top map) and this year (bottom map above). Some locations saw temperature swings of over 25 degrees from last year to this year, with Minot, ND getting a 28 degree swing in temperature from March 2012 to 2013. We talked about some of those swings a couple of weeks ago but a more complete list is available from NOAA. Last March (2012) featured a number of states with record warm months of March -- this year, nine states featured a top 10 coldest March on record -- with South Carolina and Florida ranking fifth coldest on record. Records go back to 1895 on a standardized national basis. Pennsylvania, which set a record last year for a warmest March across the state, ended up with the 35th coolest March since 1895. 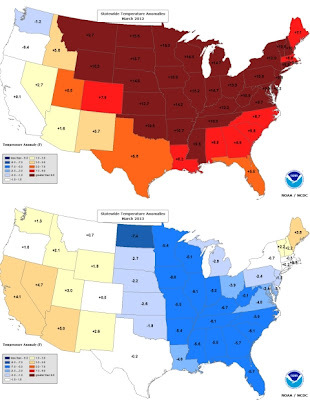 The only states that featured significant warmth compared to average were California, Nevada, and Arizona -- all of which finished among the ten warmest Marches since 1895. Nationally, this was the coolest March since 2002 and 43rd coolest since 1895.